Product prices and availability are accurate as of 2019-04-22 04:25:31 UTC and are subject to change. Any price and availability information displayed on http://www.amazon.com/ at the time of purchase will apply to the purchase of this product. 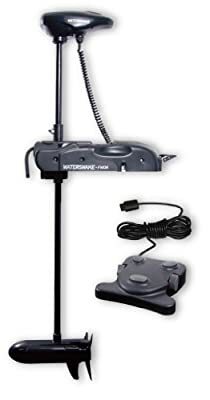 The Watersnake FWDR44-48 Shadow Foot Control Bow Mount Trolling Motor allows you to control the direction or speed of your boat with a touch of your foot with the variable speed foot control unit. Shadow DR motors are stringently built to withstand the harsh conditions associated with freshwater fishing and you will come to appreciate the sleek design of these motors along with the silent yet powerful motor. The most popular of all Watersnake motors; all models are fitted with stainless steel propeller shafts, propellers and corrosion free composite shafts that flex on impact. The 3-blade propeller has a weedless design that can chew through the heaviest of underwater grasses and marsh. A cut-off switch is installed that engages as soon as the motor is placed in the stow position. Features a 44-pound thrust while running on 12-volts of power and a 48-inch shaft. The mounts are very easy to install, easy to stow and light to carry. Another innovation is the placement of the potted circuit board, fully waterproofed and sealed in the motor casing for extra protection. The Watersnake FWDR44-48 Shadow Foot Control Bow Mount Trolling Motor comes with a 2-year warranty. Watersnake fresh or salt-water electric motors offer consumers more power and reliability for fewer dollars. Stringently tested and evaluated in the harshest environments and used by fishing guides around the world, Watersnake trolling motors are constructed from high quality components. Since their release in 2006, Watersnake has proven their reliability. Super quiet on the water, these electric motors come in transom or bow mount configuration with a choice of tiller steer or electric foot control.